Meet Dylan Guerin of the University of Nevada, Las Vegas. The graduate student in Dr. Ai-Sun Tseng’s lab is currently training at his first course at CSHL: Cell & Developmental Biology of Xenopus: Gene Discovery and Disease where he has been perfecting his injection and imaging skills, and learning how others use Xenopus embryo in their work. Our lab is interested in studying the mechanisms underlying regeneration. Specifically, I am interested in genes controlling embryonic eye regeneration in Xenopus laevis. I was interested in regeneration before applying to graduate school. It is amazing to me how some animals can completely regrow lost appendages and it would be even more amazing if we could do that as well. I am just naturally curious about the world and that curiosity was luckily encouraged by my parents. Science was the natural path to follow to feed that curiosity. Was there something specific about the Cell & Developmental Biology of Xenopus: Gene Discovery & Disease that drew you to apply? My advisor brought the Xenopus course to my attention as a way to interact with other Xenopus labs as we are the only lab in Nevada working with Xenopus. Personally, I wanted to learn how to perform micro injections and gain more experience with imaging. The injection and imaging skills I learned here will be useful in my research as they are techniques we use in our lab but I have not had the chance to perfect until now. From talking to others in the course, I have gained a new perspective about how they utilize the Xenopus embryo from a developmental point of view--where I look at it from a regenerative lens. They are similar but with some interesting differences. My key takeaway is that there are many different approaches to using Xenopus to answer scientific questions. The course is a good way to see what others in your field are doing. Also, you get as much out of the course as you put in. It was great to meet people from all over the world and get to know them. The personal interactions I have had here have been very enjoyable. Dylan received a scholarship from the Howard Hughes Medical institute (HHMI) to cover a portion of his course tuition. 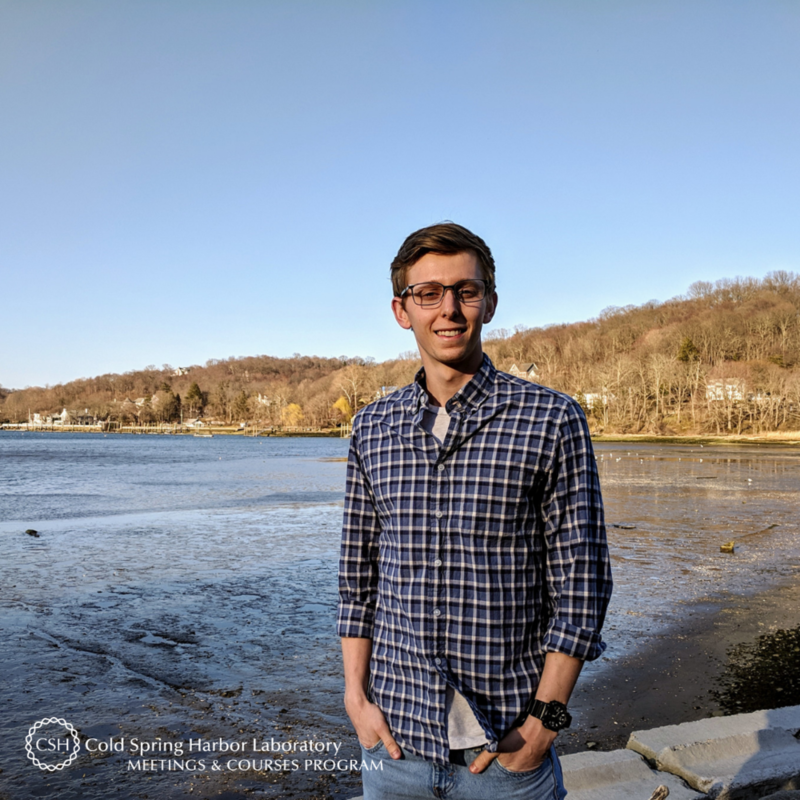 On behalf of Dylan, thank you to HHMI for supporting and enabling our young scientists to attend a CSHL course where they expand their skills, knowledge, and network. Thank you to Dylan for being this week's featured visitor. To meet other featured scientists - and discover the wide range of science that takes part in a CSHL meeting or course - go here. Meet Chad Hobson of the University of North Carolina at Chapel Hill (UNC-CH). A second-year graduate student in the physics program at UNC-CH and member of Richard Superfine’s lab, Chad is at CSHL training at the Quantitative Imaging: From Acquisition to Analysis course thanks in large part to a fellowship from the Helmsley Charitable Trust and support from the Graduate Student Opportunity Fund at UNC-CH. My main interest is in designing new systems that combine cutting-edge microscopy techniques with force-measurement instruments to investigate the mechanics of single cells. Specifically, I am using a combined light sheet microscope and atomic force microscope to investigate the mechanics of cell nuclei. I toured Rich Superfine’s lab during an undergraduate summer program (REU) at Duke University and loved the idea of combining force and imaging techniques and fundamental physics to understand the mechanics of single cells. The field was entirely new to me, but the ability to design and invent as well as use my physics background was inspiring. During my freshman year of undergraduate school at Lynchburg College, my professor, Dr. John Eric Goff, approached me and asked if I would be interested in conducting sports physics research under his guidance. I started work with him in the summer before my sophomore year and have not looked back. I have changed gears from sports physics to nuclear physics to now biophysics, but my passion for research has remained unchanged. Was there something specific about the Quantitative Imaging: From Acquisition to Analysis course that drew you to apply? I really wanted to get hands-on experience with a variety of imaging techniques in order to both broaden my general knowledge of microscopy as well as understand the difficulties and limitations of each technique. These skills will help increase the rigor and success of my graduate research going forward. Everything I have learned directly applies to our lab. Whether it is general maintenance and care of optics or a more detailed understanding of each component of a microscope, I am excited to share what I have learned with my fellow lab researchers. The biggest takeaway so far is that I will never know everything about microscopy, and that is okay. At the course, however, we are building up from the basics so that I can develop a working knowledge that applies to almost all imaging modalities. Moving forward if I need to understand the detailed intricacies of a certain method I have the foundation to do so. Take it! The instructors are beyond fantastic and helpful, and you will never look at a microscope the same way again. I have truly enjoyed getting to know the fellow students and instructors at the course. We all come from such different backgrounds and fields, so learning about what brought us all here together has been an enlightening experience. Chad received funding support via a fellowship from the Helmsley Charitable Trust and from the Graduate Student Opportunity Fund at UNC-CH. On behalf of Chad, thank you to these organizations for supporting and enabling our young scientists to attend a CSHL course where they expand their skills, knowledge, and network. Thank you to Chad for being this week's featured visitor. To meet other featured scientists - and discover the wide range of science that takes part in a CSHL meeting or course - go here.